Home Redmi Report Smartphones upcoming launches Xiaomi Redmi Y3 launch date is official now! Xiaomi Redmi Y3 launch date is officially confirmed by the company and this upcoming mobile phone will be launched in India like Redmi Nore 7 Pro. The smartphone is showing on the Amazon.in, which confirmed the launch date and some features of this phone. This phone will be launched on 24th April of this month. This phone will be launched for the selfie lovers and you will get a 32 MP front camera for the best selfies in the pricing. The dual-camera setup can be used on the rear side with the LED flash. The fingerprint sensor will be placed on the rear side and there won't be any under display fingerprint sensor, which is a good thing. 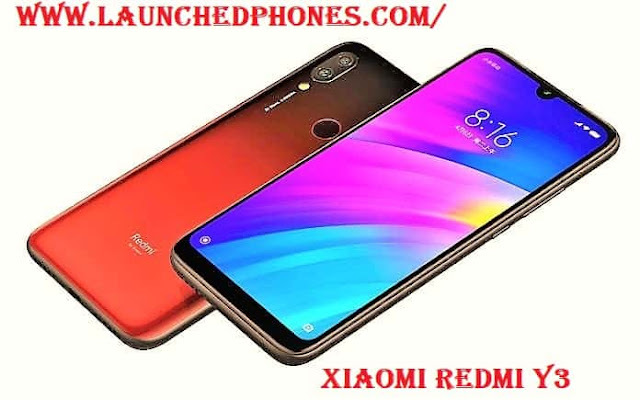 The Qualcomm Processor will be used in this phone but nothing is confirmed about the processor name but according to me, this phone will be launched with the Qualcomm Snapdragon 632 or 636 because Redmi Y2 was launched with the Qualcomm Snapdragon 625. The water-drop notch display design will be used in this phone and Glass panel can be used this time too. The Redmi branding will be used on the rear side.